Husband Walter and I were enjoying our first full day in the Smoky Mountains on an April pre-Easter trip. 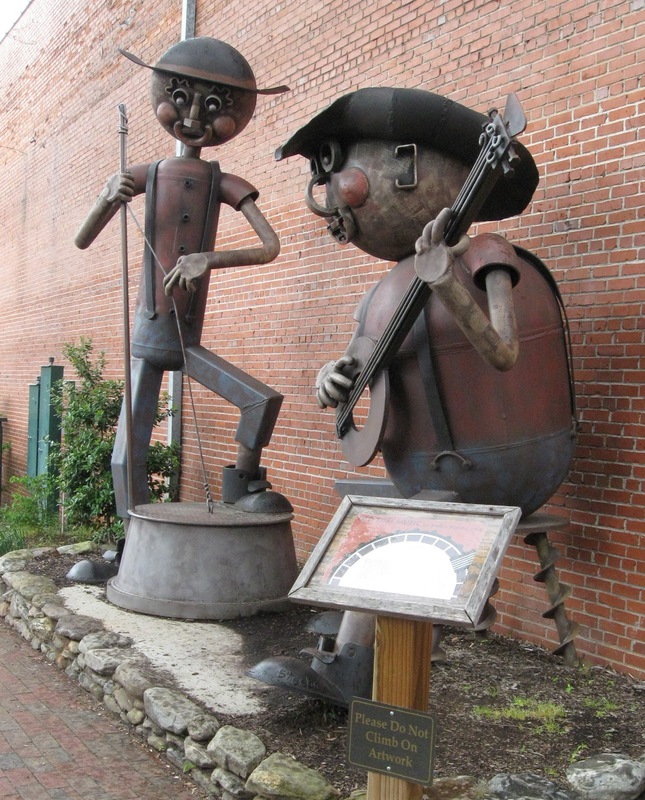 A series of circumstances sent us on an itinerary-expanding jaunt to Waynesville, NC, where we encountered the musicians pictured above. Hubby had said to let him know if there was something I wanted to do, so I did. Our ultimate destination was a local art association exhibit of recent work of regional artists. Inspiration was the invited artists' visits to local gardens that were to be featured in Waynesville’s 2012 annual spring garden tour. The mix of local art and gardening was an intriguing combo, expressed in painting, jewelry, metal, clay and wood. Husband Walter posted about the art exhibit here. But Waynesville had more pleasures in store for us. 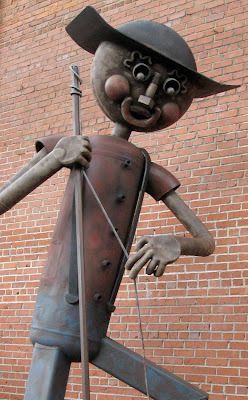 When we exited Gallery 86, the metal sculptures of mountain music in the making across the street demanded a closer look. I wanted to capture these delightful musicians, but rain sent us scurrying to our van. After lunch I thought hubby had gotten turned around when he headed back to the town center. No, he had returned to the vicinity of the super-sized musicians. It was still damp out, and hubby took my little camera, left me snug in the van and fulfilled my wish for photos of the pair. 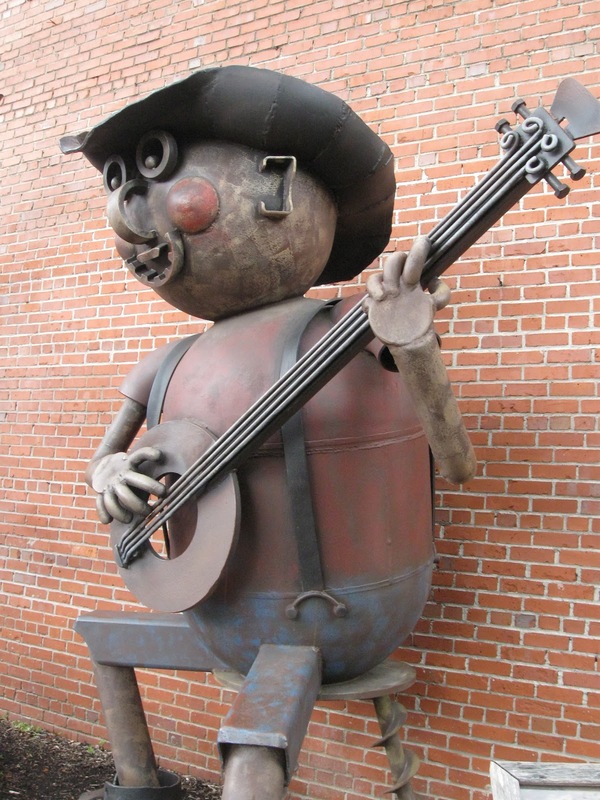 I have since learned that the whimsical metal sculpture by Stefan “Steebo” Bonitz was the first work in a well-planned project for permanent public art in Waynesville. The photos of subsequent installations and the story here of the process of planning, community involvement and execution has instilled the desire for another visit to Waynesville, NC, on our next Smokies trip. Bonitz's work ranges from folk art to high design. His bio is here. These are wonderful! Did Walter buy the gorgeous butterfly picture? I couldn't tell by reading his blog. love the photos of this picking pair. good hubby to go back for these. i would love to see them to. Ginny, Yes, although we couldn't take it with us. It will be shoppedonce the exhibit wraps up. Sandra, I agree, good hubby. And wish I had thought of "pickin' pair" Evidently in addition to puns, you excel at alliteration, also, 2 of my word favorites. One Stroky’s Journey: Is It Age?